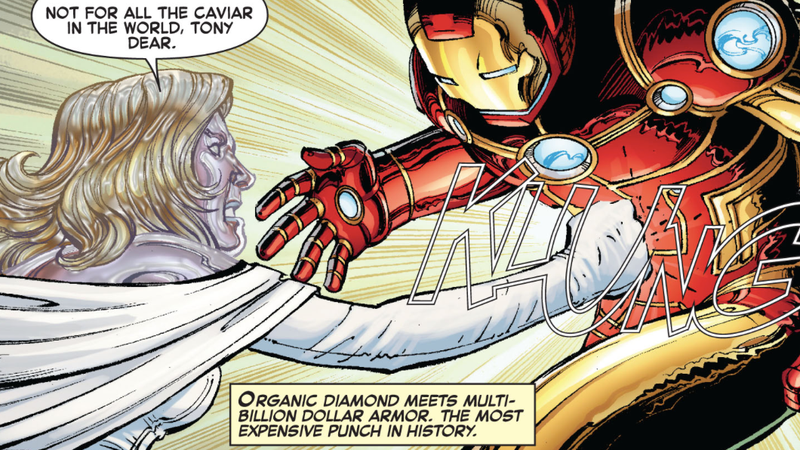 Emma Frost punching the hell out of Iron Man. Marvel Studios’ parent company Disney would very much like to get its hands on all of the sweet, juicy, profitable comic book IP that Fox smartly secured back in the ‘90s, but the House of Mouse’s tentative $52.4 billion offer might no longer be enough to seal the deal. Currently, Disney and Fox’s shareholders are scheduled to meet this summer and vote on whether that particular acquisition offer is to the liking of all parties. Obviously, $52.4 billion in Disney stock is nothing to sneeze at, but Comcast’s decision to bring cold hard cash to the table is a bold move that can’t be ignored. This isn’t actually the first time that Comcast has made a bid for Fox’s assets, though previous negotiations stalled due to serious antitrust concerns. But with AT&T and Time Warner’s potential merger looking more and more like it’s going to happen, there’s a chance that another deal between Comcast and Fox might not draw as much concern. All of this really boils down to these companies needing to buff out their catalogs of content in order to prepare for the future of entertainment: streaming. Disney’s got a service in the works, Comcast wants to grow theirs, and now Fox has to decide which suitor it wants to take to the ball.